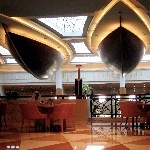 You are lucky, the occassional series on my favourite hotel lobbies in Dubai gets a new instalment already. 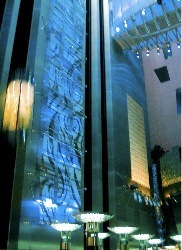 Today it's the mysteriously shaped Grand Hyatt hotel. I mean to visit the Grand Hyatt every time I pass it on the way to the airport, or anyplace else that requires me to cross Garhoud bridge. The Hyatt's location on the edge of the creek means it straddles two areas of Dubai: Old Dubai, centred on the creek, with its abbras and trade port, souks and once-glamorous office blocks; and New Dubai on Sheik Zayed Rd (about to be overtaken by New New Dubai with Marina and sprawling developments). But there is nothing split-personality about this place, it exudes wealth and conspicuous consumption. Unlike the Fairmont lobby's warren of dim rooms this is an open space, almost outdoorsy. This is mainly due to the tropical paradise that form the centre of its space, with tall palm trees and lush climbers, expansive ferns and bushy shrubs grouped around pools, streams and waterfalls. All the foliage is real, not of the ever-lasting plastic variety, unlike the boulders carved from dyed concrete to give that jungle look. Still the Koi carp don't seem to mind, and all that's missing is some parrots and the noise of growling panthers over the loudspeaker. There is also a noticeable investment in strange light fittings, such as the oversized pineapple dangling from a UFO-shaped crystal chandelier, as well as four dhow hulls suspended from the ceiling above the aforementioned jungle. Oh, and then there is the pair of light panels on either side of the stairs covered in what seems to be the output of a Murano Glass Blowing for Beginners course, a mass of curled and twisted glass pieces in blue, red, turquoise and white. Quite stunning in size and sheer design nerve. All in all the quiet place, and if you like jungle, it's a must. As to the mysterious shape of the hotel, the irregularly curved buildings describe the shape of the word 'Dubai' in Arabic when viewed from the air. Who would have thought it, after all the long hours, crisis and continent-crossing efforts, the Dubai International Financial Centre actually launched on time. Since Dubai may not be the inventor of the Soft Launch, but certainly a big fan, DIFX took a leaf out of that particular book and started operations on a small scale on Monday. The building contractors, who had been putting in a lot of hours to get the building finished on time for the start of trading, pulled out all the stops to get everything cleaned up and smartened up for the press conference. This included laying a large area of turf, which has already started to go brown because the sprinkler system that usually goes into the ground before the planting hadn't been completed. Such is the desire to make it look nice, specially as there was a rumour that Sheik Mohammed may attend. Still, in the end it all went well, and then it was the party in the evening that was the thing. Everyone met at Lotus One at the Novotel, where champagne flowed freely and the waiters distributed delicious snacks. After that some of us retired to the Kasbar (as in "Rock the..."), my first clubbing experience in Dubai. There is still a lot to do at the exchange, with IPO's promised to be happening thick and fast and new members joining every week. For now I think everyone is just glad that trading is happening after such an intense effort by everyone. More protests have taken place in Dubai by workers who were demanding their overdue wages. This time they were 100 Egyptian labourers working for Kuwait Control Company who hadn't been paid for three months. They staged a sit-in in Al Ghusais, an industrial part of town, and were paid eventually. The late payment and bad treatment of workers has suddenly become a hot topic, with opinion pieces calling for fair treatment and the Ministry of Labour finally getting beyond merely repeating that they will consider all complaints, but then requiring formalities (and payments for form-filling and submission) and only considering a claim if the wages are two months overdue. 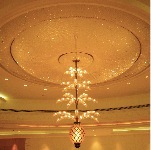 Second in this series of (very occasional) lobby stories, I will tell you of the splendor that is the Fairmont hotel. Like the Emirates Towers hotel the Fairmont is located on Sheik Zayed Rd, but on the other side of the road, which makes it near inaccessible to us the way traffic congestion is developing lately. So we rarely come here, except sometimes on fridays for their exquisite brunch buffet with fantastic seafood bar and unlimited champagne. It's a shame, really, because the lobby here is a marvel of design ideas, although also a bit of a rabbit warren. 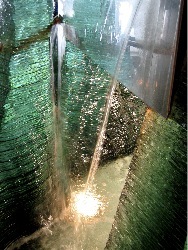 As you come in at the front there is the obligatory water fountain, a complicated arrangement of cut glass slabs, steel curves and uplighters placed strategically underneath the falling sheets of water. The masterpiece is the centre area of the building, a dimly lit cavern 10 storeys high that houses a restaurant and 8 interior glass lifts shuttling up and down the hollow interior of the building like something out of The Fifth Element. With walls of brushed steel and pierced metal light panels the place has an industrial feel, tempered only by vast amounts of dark wood for everything from seating to plant pots (plants as in palm trees, nothing small here) and gloriously OTT light projections, reminiscent of a funky night club with their swirly patterns and changing colours. 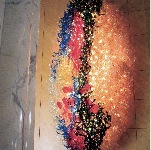 The best part for my taste is the back of the lobby, behind all the glitz and ostentation. The Coffee Culture cafe is particularly busy today with geeks from GITEX 2005 at the World Trade Centre opposite, and always does great lunch and coffee, of course. It's not flash, but the waiters are super-nice and the muffins extraordinary. And free WiFi at lunchtime! It's amazing what things we can think of to occupy our time here. Yesterday Louisa and I went to get a make-up lesson. 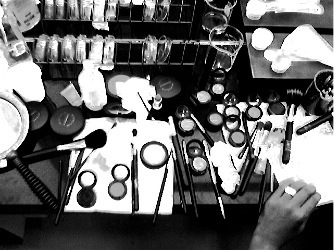 The make-up artist entered the room with a stunning array of pots, tubes, bottles, bowls and brushes, then went off to get some more. We had decided that we had not changed the way we used make-up in the last 25 years, and it was time to get an update "for the mature face", as Louisa so delicately put it. Plus, hey, it would be fun. After being moisturised and covered in a base coat (sorry: foundation) we got to work on our eyes. The make-up artist would do one eye, and we would copy what she did on our other. Not as easy as it looks, specially if you have to keep your eyes closed while she is doing the work. The eyes were a major amount of effort, what with sculpting with colours and shaping the eye using only mascara and eye shadow (and getting my eyebrows plucked for the first time ever!) , whereas putting on a decent lipstick and blusher was completed in a jiffy. After two hours we were ready to face the World again, Louisa with a great work look and I suddenly transformed into something glamorous and sophisticated (well, at least round the eyes). Not only is the local police department cracking down on bad drivers, their latest target are cars with excessively tinted windows. The traffic situation and anything to do with driving in this town is a perennially favourite subject for Dubai citizens. The newspapers are full of letters from irate drivers/cyclists/pedestrians bemoaning the lack of respect from other road inhabitants, it's a subject of discussion for parties and get-togethers and a constant source of fear for visitors used to the sedate driving style of the Western World. One aspect unique to this climate is the tinting of windscreen and side windows. Some claim that it reduces heat inside the car when it is parked in the sun or when driving, others insist on being invisible to the public in the name of religion (Muslim women who also wear the hijab, usually, although more often young local drivers with more horsepower than sense). So there are rules: no tinting beyond 30% (except with special permission) and no mirror tint. Unfortunately window tinting is big business in Satwa and other parts of town, so the police is cracking down on the abuse, because windows that are too dark can be a danger, specially when driving at night. The penalty for excessive tinting is a fine of Dh 500 and having the vehicle impounded for at least a week. In an attempt to minimise effort the police has decided to target the private cars of its own employees first. I guess walking round the car park is a quick way of making the monthly fine quota. 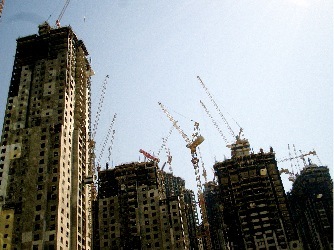 Dubai property development is at its craziest at the moment, and right now there is no better place to see this than Citycape 2005, a property exhibition to end all property exhibitions. It is quite overwhelming. 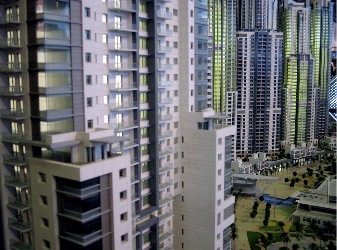 All the local developers show here, from Damac to Emaar, Dubai Holding to Nakheel. When we first arrived and heard about the current building projects, we thought they were impossible to achieve, just lofty dreams: the Marina and Jumeirah Beach Residences, featuring 40 high-rises along the beach, are nearing completion; theBurj Dubai, with the Dubai Mall and Downtown, has already risen above ground level and is planning to complete a level a week of its undisclosed number of floors (it is planning to be the highest building in the World, at least until it is overtaken by Al Burj, part of the crazy Waterfront project); The Mall of the Emirates is about to open its long-anticipated ski slope with real snow (the advert claims that "this year Dubai will experience its first winter"); and the World islands development is already old news, having risen from the waters for the last year and sold to the likes of Rod Stewart and Elton John. Now that these unfeasible ideas are under development, and some are already inhabited (although famously thePalm Jumeirah has deferred occupation from this September), a whole new crop is introduced, these ones really impossible: Business Bay wants to extend the creek to curve round and end at Sheik Zayed Rd near the Burj Dubai, while building a huge business centre along this new riverway; the Waterfront project will add 375 km of beachfront to Dubai, curving round the still-planned Palm Jebel Ali (which is the third Palm island after Jumeirah and Deira, and includes a curve of stilt houses whose outline spells out a poem written by Sheikh Mohammed himself). It is joined to Arabian Canal, similar to Business Bay in that it channels water into desert areas, encircling the new Jebel Ali airport (transport concerns have never been the local developers' strong points). And then there is the development that creates the biggest stir here (although it's possibly enhanced by the large special entertainment budget including at human-size robot and a dinosaur guarding its eggs with ferocious growls). 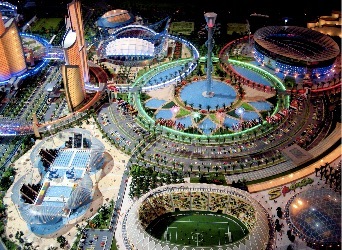 Dubailand, although badly named, seems to have serious thought behind it, its brochure full of graphs showing the increase in tourism and potential rates of return for investors (it is a plan by Dubai Holding, the government-owned group with 20 subsidiaries, including the Jumeirah hotel chain). The idea is to build a huge tourism destination out in what is nowhere right now, but due to the vast increase in housing developments along Emirates Road will soon be merely on the periphery of New Dubai. 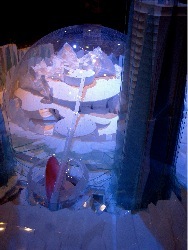 It includes such gems as Ski Dome (yep, another one, this one promises real penguins) and Falcon City with its Eiffel Tower, Taj Mahal and Leaning Tower of Pisa hotels, all 1.5 times life size. Restless Planet is the reason for the dinosaur in the exhibition hall, as it's one of the many theme parks planned in the 3 billion square feet project. Dubai is planning on 15 million tourists by 2010 (up from 5.4 million in 2004), by which time phase one of Dubailand should be complete. Dubai saw its first stirrings of labour organisation this week with a demonstration by workers who hadn't been paid their wages for 5 months. There are no unions here, and most workers are at the mercy of their employer who recruit them en masse through agencies and house them in what are tellingly called 'labour camps', large area of communal housing in the dustier parts of town. All these workers are recruited for the immense construction projects going on all over the place and mostly come from the sub-continent. It is common practice for companies to withhold two months salaries to 'prevent absconding', but this week saw the first time workers took to the street to protest the fact that they hadn't been paid for 5 months. They blocked Sheikh Zayed Road for a short time, but moved peacefully to the side of the road after police arrived. The manager of the company, Al Hamed Development and Construction, was taken to the police station. Al Hamed is one of the contractors working on the Palm Jumeirah project. When the Ministry of Labour and Social Affairs sent inspectors to meet with the workers, they told the company that they would have to pay within 24 hours or workers could transfer their sponsorship and still claim their dues. Their had already been four complaints against the company in the past. We'll see what happens next, as this seems to be a new development in the way workers allow themselves to be treated. One of the most unfulfilling jobs in Dubai must be weather reporting. "Very sunny", "sunny again", "lots of sunshine", you get the picture. Maximum temperature this September so far is 44.6ºC, measured last Monday. But it looks like we are on the way to getting our own little micro-climate. All the construction work and artificial lawns, together with the incredible traffic increase in the last few years has resulted in higher temperatures in the area. Not enough that we live in the desert, but we are building our very own "heat island" with all the new concrete, according the Dave Thomas of the Met Service at Dubai Airport. August was so far hottest for 5 years, with a maximum temperature of 47ºC, although Al-Ain did even better, beating the 50ºC limit. Luckily, as the weather gets hotter, it also gets less humid, so it will feel cooler. But that will not prevent you getting just as sunburnt. It's almost time for the Dubai exchange to go live, and the last people have moved out of the temporary offices into the shiny new building at the financial centre site. They were literally drummed out of the place. While boxes and chairs were carried down one staircase, we snuck into another entrance to get breakfast, where Dubai Drums were stirring the place up with their African beats. 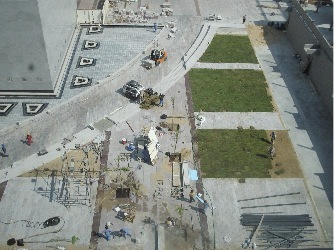 After 15 months in the 'shed' most people were glad to move into the final location, 'Precinct 5', next to the landmark Gate building. 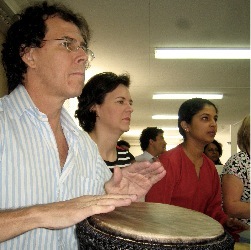 To say good-bye, the Marriot hotel laid on a scrumptious breakfast, and to add a de-stressing factor to the morning, everyone was invited to join in the drumming. That sounded like a recipe for a lot of noise to start with, but in actually turned out to be a powerful sound. Talents emerged with a resident didgeridoo player and some great dancers as well as a fabulous frog backing band (respect to Emily, Pauline and Muna). 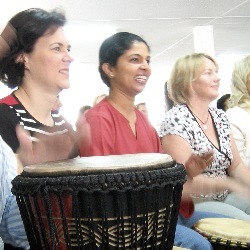 Listen to real-live drumming here! Today we are back online with news of an event that's turning our flat into a 'location'. 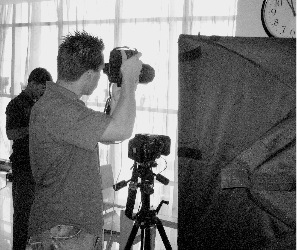 We have a photographer in the house to do a photoshoot for Homecentre, one of the biggest local furniture stores. Their campaign involves images of empty spaces that show where the customer could fit objects bought at Homecentre. 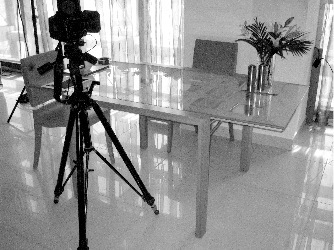 We have new armchairs, lamps, cupboards and all sorts of lovely accessories blocking up the corridors, as well as flash lights on stands, big cameras and bags full of film (yes, still working with film). If you are in Dubai, look out for pictures of our living room plastered all over the bill boards at BurJuman and Sheik Zayed Rd as well as adverts in Inside/Out and Ahlan. Concert highlight of the year, the Black Eyed Peas were here for a concert at Airport expo. A groovy session, although it would have helped if the sound had been better. Although Airport Expo is not actually based in an aircraft hangar, it certainly sounded like it. But otherwise the event was very civilised, with food and drinks stalls (even selling six-packs of Corona), free M&Ms and lots of space to dance. We got free tickets courtesy of a friend who won them in a radio competition, but I expect the people who paid something like 400 Dirhams for the VIP tickets at the back of the auditorium were probably a bit miffed to be miles away from the stage. But the Peas did their energetic hip-hop thing and the school kids as well as the grown-ups were entertained with the usual hits and plenty of backflip action on stage.